The addition of sweet, local peaches in these homestyle baked beans makes for a comforting dish that everyone will love. Add a few shakes of cayenne pepper for an unbeatable mix of spicy sweetness. Heat the olive oil in a large saucepan. Add the onions and cook until softened, about 5 minutes. Stir in garlic and let cook until fragrant, about 1 minute. Mix in the navy beans. Add the water, tomato paste, maple syrup, mustard and tamari to the bean mixture, stirring until well combined. Mix in peaches and bring to a boil, then reduce to a simmer for 30 minutes, stirring often. Check the seasonings, adding salt to taste. You don’t want to add the salt too early—the beans will toughen. Continue to simmer for an additional 25 to 45 minutes, until reduced and flavours have come together. Note: Cooking the beans from scratch—as opposed to using canned—will give you the best flavor. 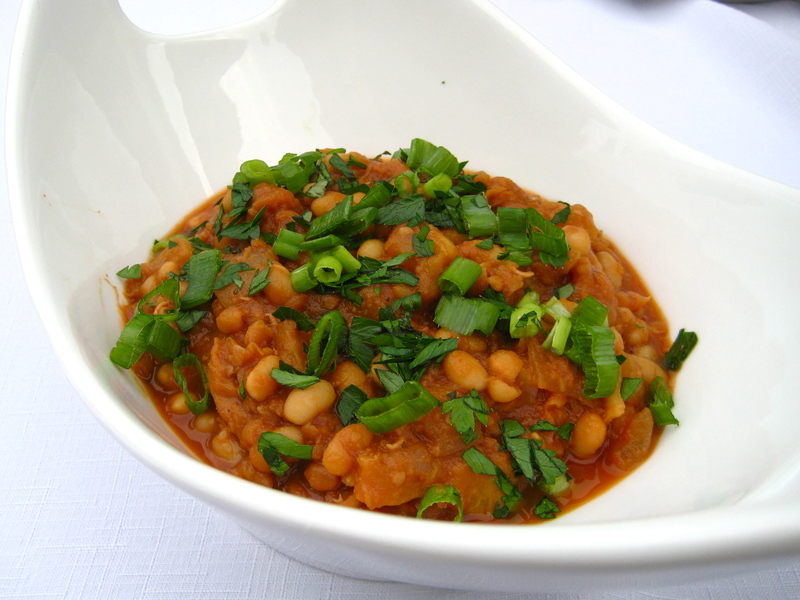 If you are using canned beans, lower the cooking time by at least 20 minutes, as the beans will become mushy. You may also need to add less tamari and salt if the beans are already salted.